Coach to Olympians, World Championship qualifiers, and six individual Top 10 finishers at Major Marathons (Boston, NY, Chicago). Writer on the science of performance with his latest book (Peak Performance), numerous print articles (including in Wired, Sports Illustrated, NY Magazine, and others), and a popular newsletter. Lecturer in Exercise Science and Strength and Conditioning at St. Mary’s University (UK). Media: has appeared on major TV (BBC, CNN, and more), major print media (The New Yorker, The New York Times, The Wall Street Journal, ESPN, National Geographic, Wired) and numerous radio shows and podcasts around the world. Consultant to executives, business leaders, professional teams, and more on a wide range of topics including: motivation, team dynamics, mental toughness, resiliency, effective leadership and more. Interested in consulting, mentoring, or one-on-one coaching, contact Steve here. Steve Magness is a performance coach, author, and lecturer. 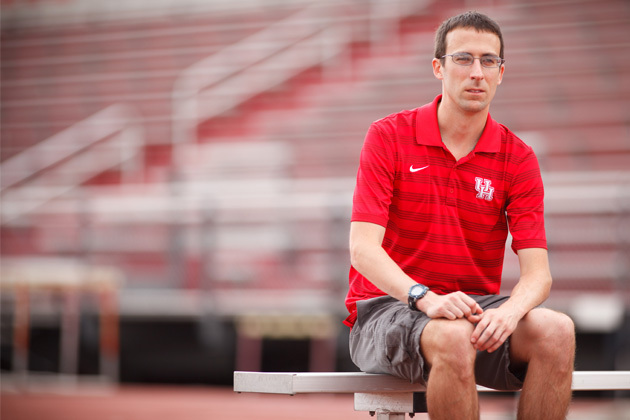 He currently serves as a coach to almost 20 professional runners, is the Head Cross Country coach at the University of Houston and a Lecturer of Strength and Conditioning at St. Mary’s University, UK. In addition, he has served as a consultant or executive coach to high performers in a variety of business fields. High School state champions, NCAA regional champions, and National Qualifiers. Some of the notable athletes he has coached include Sara Hall, Mark English, Natosha Rogers, Jackie Areson, Neely Spence-Gracey, Sarah Crouch, Brian Barraza, Lea Wallace, and numerous others. As a writer, He just published his 2nd book, Peak Performance(Rodale, June, 2017) with co-author Brad Stulberg about performance across domains. His first book, The Science of Running, was an Amazon Top 100 bestseller. He got his start in writing as a columnist for Running Times Magazine. Additionally, his work has appeared in Wired, New York Magazine, Sports Illustrated, Runner’s World, Outside Magazine, Meter Magazine, New Studies in Athletics, and the International Journal of Athletic Training & Therapy. As an expert, Magness has been featured in articles in The New Yorker, Wired, Runner’s World, Outside magazine, The Wall Street Journal, The New York Times, National Geographic and ESPN the Magazine. Magness has also been featured as an expert on TV for the BBC, CNN, BeIN Sport, as well as a variety of radio stations throughout the world. As a consultant, Magness has worked with a variety of businesses, executives, entrepreneurs, and athletes. He has also served as an advisor to numerous tech startups. Finally, as a runner, Magness ran a mile in 4:01 as a High School runner, which, at the time, ranked #6 all time for US prep athletes, and ranked him #1 in the US and #3 in the world as a High School athlete. He went on to compete at both Rice University and the University of Houston, reaching Academic All-American Status and qualifying for the NCAA National Championships. ESPN The Magazine: Is this the end of Lebron James? The New Yorker: What is Fatigue? Wired: What’s up with Running: Why does it hurt?